This entry was posted on January 25, 2017 by Rachel. The beginning of a new year necessarily brings about changes, and HTC is proof of that. With their new phones, the HTC U Play and HTC U Ultra, the company wants to present itself as innovative and able to compete with its competitors. In this article, we will introduce you the features of the two most recent HTC phones, keep reading if you are interested! The biggest change with these new smartphones is the design - especially the colours. We find the smartphone in several colors: Brilliant Black, Cosmetic Pink, Ice White and Sapphire Blue. Do not be surprised if you do not see a headphone jack on the HTC U Play and U Ultra, HTC has decided to part with it, just like Apple with the iPhone 7. Both operate under the new Android 7.0 Nougat. The screen of HTC U Play measures 5.2 "and has a Full HD resolution.The two cameras are 16MP and the video recording is done in 1080p.The battery would be a little weak with 2500 mAh. As for the HTC Ultra, it has a slightly larger 5.7-inch screen and a 64GB memory. The rear camera is 12 MP and allows you to record videos in 4K. As for the front camera, it is 16 MP! The battery has a little more capacity since it is 3000 mAh. It will be available mid February for 799 €. 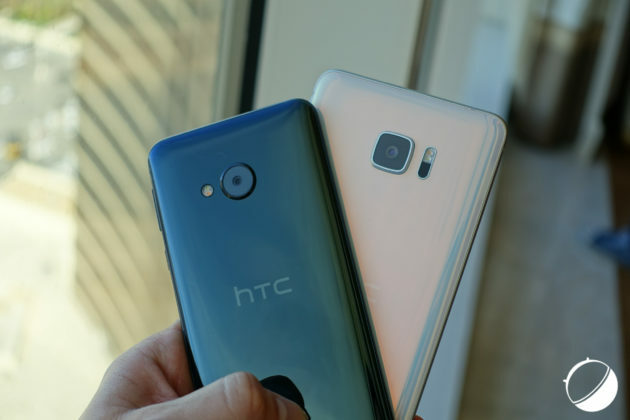 The HTC U Ultra has the particularity of having two screens, while the U Play has only one. So you can have fast access to several applications, and the second screen remains functional even when the first is in standby, which can be useful to watch the time or just check its notifications. In line with Google and company, HTC launches their voice control with HTC Sense Companion. It allows you to unlock your phone by talking, remind you of events, notify you of what is happening on social networks etc. The Sense Companion will be able to adapt the notifications according to your preferences, for example it will not read messages from the person you are trying to ignore for several weeks. It benefits from a speech recognition, so only you can unlock your phone by voice. We can not wait to see if it is really effective! What do you think of these two new phones? What phone do you expect the most this year? Tell us everything in comments! This entry was posted in High-Tech Gadgets, New phones, Smartphones and tagged New Phones, HTC U Ultra, HTC U Play, HTC U, HTC on January 25, 2017 by Rachel.